Your favorite football head and all his pals are here with enough fun and laughs to cover several city blocks! Shout! 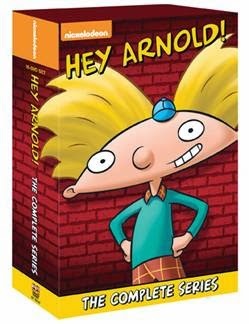 Factory released Hey Arnold! The Complete Series, on August 19th, 2014. The 16-DVD box set features all 99 big-city adventures from the classic Nickelodeon animated series. Life in the big city is one big adventure for Arnold. Living with his grandparents, who run the Sunset Arms boarding house, Arnold shares a roof with a diverse and unusual menagerie of characters (including his pet pig!). But as any fourth grader knows, some of the most memorable people you’ll ever meet are in school. With friends like Arnold’s (including storyteller Gerald, class jinx Eugene, sometime-bully Harold, and the tomboy Helga, who harbors a secret crush on our hero), you can be sure that he’s got some funny exploits to share with fans. Hey Arnold! features an all-star voice cast, including Dan Castellaneta (The Simpsons), Francesca Smith (Recess), Toran Caudell (Recess) and Jamil Walker Smith (SGU Stargate Universe). Created by Craig Bartlett as a comic in 1986, Hey Arnold! debuted as an animated short for the Nickelodeon film Harriet the Spy in 1996. Hey Arnold! went on to air on Nickelodeon from 1996 to 2001. The show also aired on "Nick on CBS" from 2002 until 2004. Whether you want to revisit your own childhood memories or create new ones with your kids, Shout! Factory has two words for you: Hey Arnold! Hey Arnold! was definitely a show I watched as a kid. So when I had the opportunity to review the complete series, I jumped at it. Not only because it brought back so many memories from my childhood, but also because I got to re-watch this series from beginning to end with my kiddos. I love when we get to watch shows together from my childhood. All 99 episodes are filled with fun-filled and crazy adventures Arnold gets himself in. Those of us that watched this show as a kid can now enjoy the entire series and watch it as many times as we want since the entire box series is available exclusively at Walmart for only $26.94. Definitely a must have for any 90's kid! Disclosure: All opinions are my own. I received Hey Arnold! The complete series on DVD at no cost for the purpose of this review. No other compensation was received.